A couple of Zynga employees have stirred up more Dream Heights controversy by posting five-star reviews in order to boost its score. It's pretty clear by now that the iOS game Dream Heights will not be remembered as Zynga's finest hour. It first came under fire back in January when indie studio Nimblebit accused it of being a blatant rip-off of its own game, Tiny Tower. That didn't stop the game from hitting the App Store but it did encourage the entirely predictable slew of one-star reviews, as did a tweet from Ian Marsh of Nimblebit saying, "I've been told that it can cost considerably more to market apps with lower iTunes ratings. 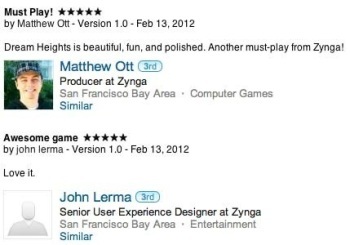 That is interesting..."
A few minutes later, Marsh followed up with another tweet about "the Zynga marketing machine at work" that included a link to a screen cap of glowing, five-star reviews written by two Zynga employees, Producer Matthew Ott and "Senior User Experience Designer" John Lerma. "Dream Heights is beautiful, fun, and polished. Another must-play from Zynga!" Ott wrote, while Lerma settled on a more succinct, "Love it." The whole thing has a glistening veneer of sleaze but in Zynga's defense, and unlike the ugly situation involving Dragon Age 2 a year ago, both employees posted their reviews using their real names and with their employment at Zynga front and center, so there's no attempt at deception. Marsh's apparent displeasure with the "marketing machine" is also a little rich given his own effort to manipulate user reviews to his benefit and while it's always more fun to root for David against Goliath, we're talking about two reviews out of nearly 200, hardly a game-changer. Ripping off game designs and repackaging them as your own is greasy as hell, but I'm not convinced that this "controversy" is anything more than a spot of manufactured publicity. Both sides are trying to turn the minefield of user reviews to their advantage, after all, and as long as the Zynga people are up-front about their affiliation, is it really a problem?